Do you ever wish you had a little more confidence and showed a bit more bravery? I think most people can empathize with the poor cowardly lion. All he ever wanted to do was rule the forest as a confident king, but his fears kept him paralyzed for years. Not anymore! After taking a trip to the wizard, this lion is ready to take on the world! The lion has been hitting the gym and he’s ready for anything that steps in his path. He can now rule the forest as king with his luscious mane and sculpted muscles. No longer will he be relegated to hiding out when trouble comes his way! Become a hunky lion on the prowl. This Macho Cowardly Lion Costume will make all the cougars swoon. Who could resist those sculpted pecs? 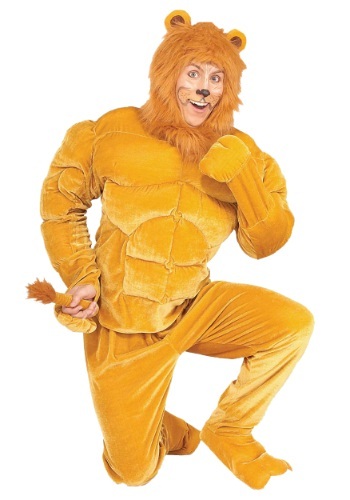 Take a stroll down the yellow brick road with Dorothy and the gang in this manly lion costume. Or simply take charge as ruler of the jungle! This lion costume comes with a velour shirt that has fiberfill padding to give you a (more) muscular appearance than you may normally have. The shirt fastens at the back of the neck with fabric ties and has an elastic finger loop on each paw to keep it in place all night. The included pants have an elastic waist for extra comfort and loops at the back to attach the tail. Top it off with the satin-lined hood and paw-shaped shoe covers for a complete lion look that will get the attention of anyone you meet on your adventures. Don’t forget to add a makeup kit to finish it off!